Plethora of guests join on a "celebration of Fogerty's iconic songbook"
Put them in, coach. They’re ready to play. Foo Fighters, My Morning Jacket, Miranda Lambert, and other big-name artists are teaming up with John Fogerty for his fall album Wrote a Song for Everyone, the former Creedence Clearwater Revival frontman has announced. Billed as a “celebration of Fogerty’s iconic songbook,” the album combines newly recorded songs the California roots-rocker’s hugely influential back catalogue with an unspecified number of totally new tracks. One of the albums from CCR’s terrific late-’60s/early ’70s run was titled Willy and the Poor Boys, but the new record’s list of contributors is nothing if not rich with talent. 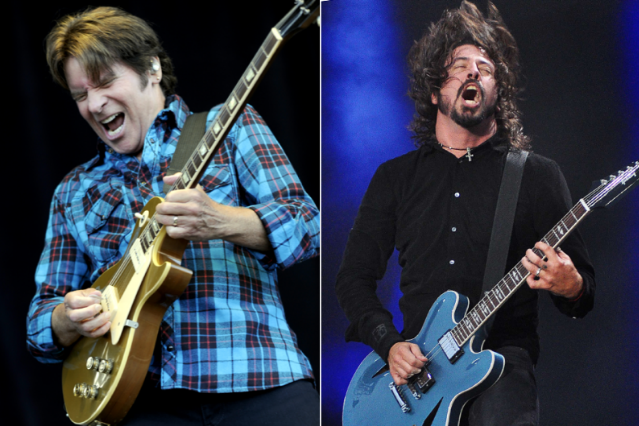 Foo Fighters will perform alongside Fogerty on class-warfare classic “Fortunate Son,” and fellow blue-collar hero Bob Seger will help out on “Who’ll Stop the Rain.” Other guests include Keith Urban, Brad Paisley, Alan Jackson, and even the rising Los Angeles folk-rock group Dawes. Who knew Fogerty was scoping out the indie circuit? Wrote a Song for Everyone is the “Proud Mary” songwriter’s first studio album since 2009’s The Blue Ridge Rangers Ride Again, which brought in guest appearances by Bruce Springsteen and members of the Eagles. His latest song, the humid rock’n’roll boogie “Swamp Water,” serves as the theme to FOX TV show The Finder. But Fogerty has also been hitting the road, and spent much of 2011 on tour, including two nights at New York’s Beacon Theatre. A full track list, including collaborators yet to be named, is set to be released soon.